Last night Tim got home from work at about 5pm and I was starting my overnight shift at 7:30pm. I immediately went to have a shower and was looking forward to having some alone time to wash off the day. Now is that point I made the mistake of calling her Greta. I spent the rest of the shower slightly tense that either she would fall, drown and float down the drain, or crawl over my back while I was shaving my legs. At one point, she did make an attempt to crawl up the wall and fell. Time seemed to slow as I watched her bungee down towards the wet floor! I embarrassingly let out a squeal as I was now slightly attached to Greta and didn’t want to see her life cut short. I’m happy to report that we both survived the shower, but needless to say, I will probably look for her next time I hop in. As this whole saga was happening, I did think that a male would probably never have this problem. He would probably just squish the spider and go on with his life, whereas I named her and got invested as to whether or not she survived my shower. And that is my story. I hope you enjoyed it and don’t think I’m a crazy person. This morning I got in the shower. 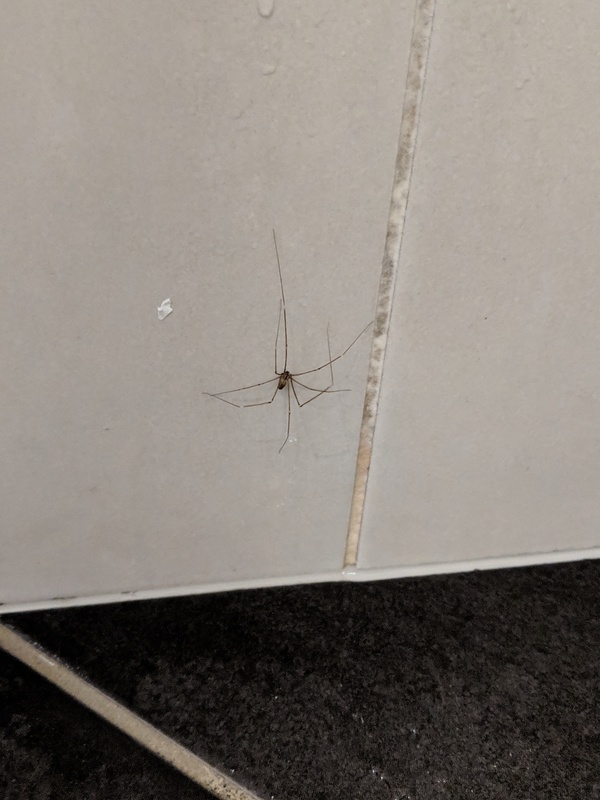 Saw a Daddy-long-legs spider on the wall. Knocked spider onto the floor, flushed it down the drain.